Price of Product: A 3 Pack of GoToob Humangear 3oz Silicone Travel Tubes is available on Amazon for $25.95. Where to Purchase: The GoToob is available online and in-stores like Walmart and Target. Description of the Product: “GoToob is the civilized, smart, squeezable tube for traveling, outdoors and more. The award-winning GoToob is made from soft yet rugged silicone, so it's easy to squeeze and dispense the product right away. A special, "no-drip" valve helps the cap stay clean. A window in the collar identifies popular contents. Rotate the window to "Soap", "Lotion" and more - tighten the cap to lock in the setting. A large opening means it's easy to fill and clean your GoToob. The small 1.25oz. size slips easily into pockets, bags, purses and other tight spots. The medium 2oz. size features a handy suction cup that can briefly attach to walls for moments when you need your hands free. And a large 3oz. size gives you maximum volume for longer times between refills. The Review: I have all of these travel size containers of shampoos, conditioners and cleansers in my medicine cabinet, ready for our next camping trip. The problem is, I may end up using my cleanser to wash my hair and my shampoo to wash my face – because I couldn’t tell you what product is in which container! If you ever had the experience of showering at the facilities in a campground, you would know that the shelf (if there even is one!) for your shampoos, conditioners, etc… is about the size of a postage stamp. Where do you put all your stuff? The GoToob by Humangear, is a cool squeezable travel tube that solves these problems and more! 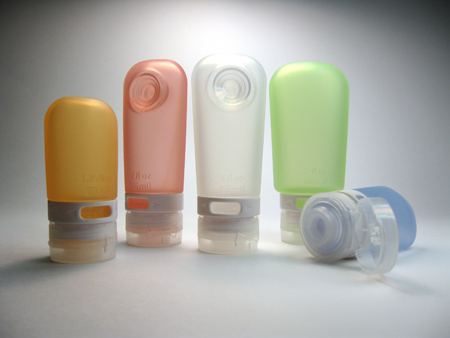 The GoToob has a clever dial that you can change to identify what product is in your travel tube – lotion, soap, conditioner, shampoo, sun (for sunscreen). Just fill your GoToob, twist to “sun” and you’ve saved yourself from accidentally applying shampoo to your skin at the beach! The GoToob containers are easily cleaned and filled – just unscrew the flip top cap to fill them. The squeezable tubes allow you to squeeze out every last drop of the product. Try doing that with those hard plastic bottles! One of the coolest features of the GoToob is the silicone suction cup on the 2 oz. bottles that allows you to stick them to the wall of the shower. Now I can use that tiny shelf in the campground shower for my bar of soap. Wow! For the more sophisticated air-travelers, you’ll be glad to know that the GoToob is carry-on approved! The GoToob also has a “no-drip” valve and it is food safe. I have to say with the GoToob, humangear thought of everything! The Giveaway: Humangear is generously offering one lucky Moms Own Words reader three of their GoToobs – a 1.75 oz. a 2.0 oz. and a 3.0 oz. To enter is easy. Just one mandatory entry! Mandatory Entry: 1. Become a fan of humangear on Facebook and leave a comment stating that you follow. Not on Facebook? Just comment on where the first place you would be taking your GoToob. Camping? Vegas? Extra Entries - For the following entries please make sure to include your email and if appropriate your link. 3. Subscribe to my blog. 4. Follow me on Twitter (http://twitter.com/kristiannm) AND tweet about this giveaway (may be done daily). 6 Grab my button for your site. 8 Follow me on Facebook. 9 Follow me on Facebook Networked Blogs. This giveaway is open to U.S. residents only and the winner will be chosen by random.org. This giveaway is open until Thursday, July 1, 2010; at 12:00 pm Eastern Time and a winner will be announced soon thereafter. If the winner does not respond to my email within 48 hours then I will pick a new winner. Good luck! The product(s) featured in this giveaway were provided free of cost to me by the author, the manufacturer, or representing PR agency. Opinions expressed are my own and are NOT influenced by monetary compensation. I became a fan of Humangear on FB. I follow you with FB Network. I'm a subscriber by email. I follow you on Twitter and I re-tweeted this giveaway @FriendlyFrugal. I have your button on my Friendly Frugalista blog. I subscribed by rss subscription to your blog today using google reader. I couldn't find a google friends connect box on your site. barb g. Email above & in profile. Yah! I did find your google friends connect, I had my screen set too large,sorry! I signed up on the box now. barb g. email above & in profile. I am following your blog now on facebook I used your badge button. Think I'll get that for my site. barb g. on fb. email above & in profile. I am a fan of humangear on FB. Follow you on twitter and tweeted about this great giveaway. I added you on FB. I am following Humangear on Facebook.